The church building that you see on the corner of Huntingdon and Columbia is more than just a beautiful facility with carpets and pews; it is a monument to a Master Builder who is building His church, a living Church of flesh and blood. The people that belong to South Abbotsford Church (past, present and future) are a part of that living body, carrying out the work of God on earth while carrying His presence within them. In the 1920’s and ‘30’s God brought groups of people called Mennonites to settle in Abbotsford. They came from Russia and the Prairie Provinces, hoping to improve their lot in life. Although farming in Abbotsford proved difficult and primitive, they worked with a sense of optimism and faith. They met in their pioneer homes for prayer and fellowship until a bigger hall was rented where more families could meet together once a month. 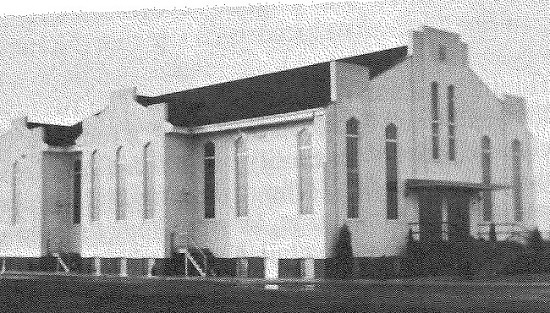 This bigger venue allowed them to become an official church as a division of the Yarrow Mennonite Brethren Church. It also allowed them to make use of their musical talents by forming a choir. As more Mennonites came, the church grew and considered splitting into North and South Abbotsford groups. The group in the south had a considerable distance to travel every time a service was held in the hall on Clearbrook Road and had already been meeting in the South Poplar School for the remaining three Sundays of the month. It was a natural outcome to buy land for their own facility in that area. So, on November 19, 1935, the south Abbotsford group became a separate church. They bought their first piece of land—a half acre—right beside the school for $20.00. 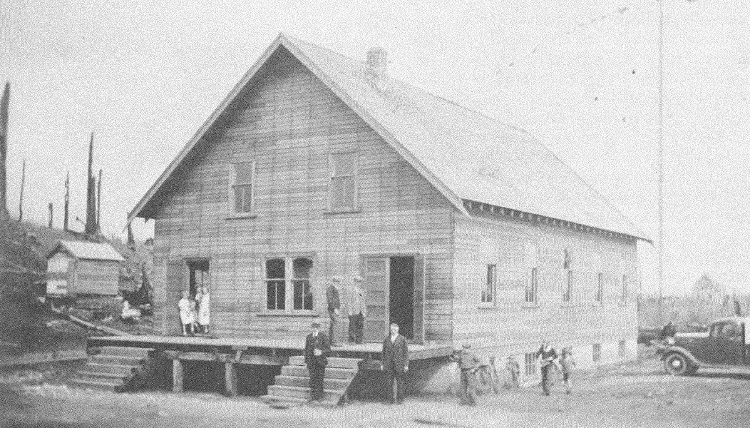 The church building was constructed by volunteers, at a total cost of $811.24. Now that the facility was complete, a zeal for the lost was making itself felt. A group of men headed out to the streets to evangelize with preaching and singing every Saturday night throughout the summer. Unfortunately, businesses complained that their entrances were being blocked and that traffic was being hindered and so another approach was sought. Several men began home Bible studies in isolated areas of the Fraser Valley which eventually developed into independent churches. These dedicated men went on to organize Daily Vacation Bible School for children which was run and supported by many of the valley churches. 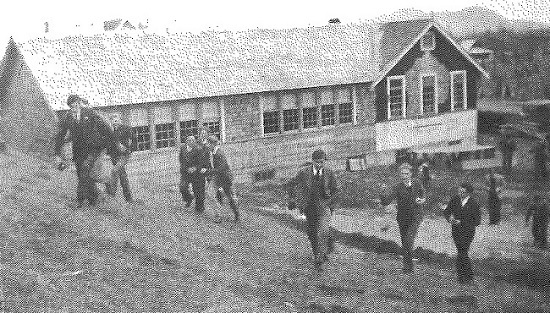 Bible School building and students on Gladwin Road 1944. Meanwhile, the church had grown so much that the building had to be enlarged. By now there were Sunday morning services, Sunday school, youth programs, Bible and German Language classes for children and weekly Bible classes. Even so, the youth were hungry for more teaching and so a Bible School program that would offer systematic Biblical training was discussed. In 1943 a building was bought and relocated to the church property. This was the birthplace of what is now called Columbia Bible College. During these years, World War II was making a considerable impact on Canada and the pacifist stance of the Mennonites in Abbotsford was about to be tested. The government was promoting Victory Bonds across Canada for citizens to help Canada’s war effort. A promotional meeting was planned in Abbotsford and the Mennonites were invited to help with the programme. They were given charge of the music and their choir sang with gusto the song: “March on! March on! To Victory, for Christ is leading on…” as well as other numbers that proclaimed the Gospel. Their participation did not sit well with the patriotic, non-pacifist listeners who used the local newspaper to severely criticize their non-resistance. However, as the military draft was issued, Mennonite men proved that they too could contribute to their country. Although a few went into active combat, most of them became Conscientious Objectors who were then assigned to alternative service. They served in the Medical Corp, in the Forestry Department and in farm labor giving one or two years of hard labour in exchange for room and board and a small stipend. As the war ended and the young men came home, thoughts turned to more immediate needs at home. The growing success of the Bible school spurred the congregation on to discuss an educational facility for their high school children as well. They realized their children needed secular training, but desired it to be given in a Christian atmosphere. The Ministry of Education was amenable to the idea of a private high school and so in 1946 MEI, or Mennonite Education Institute, was born. In the meantime the church was continuing to grow. Even though groups of members left to join other church plants in the area, the sanctuary was still too small! The congregation began looking for property, one that the Lord had chosen. The Lord directed them to a site on the corner of Huntingdon and Columbia. There was a 20 acre lot owned by a member of their own congregation who was willing to give it to South Abbotsford Church if they would pay the remaining mortgage. This was agreed upon and a new sanctuary begun. On October 3, 1954, the last service in the old church was held as an outpouring of Thanksgiving for the many blessings experienced in the past 19 years. The theme for that evening was Psalm 26:8 “Lord, I have loved the habitation of Thy house and the place where Thine honour dwelleth.” With joy and gratitude the congregation said goodbye to the old South Abbotsford church and turned the page to a new chapter in the life of this body of Christ. Outreach continued to communities such as Straiton and Otter Road. A prison ministry was initiated and special homes built for the mentally handicapped. Pioneer Girls and Boys’ Brigade were held to reach the boys and girls in the community. Even a ‘Wee College’ program was made available for preschoolers to be taught Scripture in verse and song. When the immigration of East Indians to Abbotsford began increasing, the church was moved by the need to give them the Gospel. As a result, the church chose one of their own countrymen to begin a ministry to Indo-Canadians in 1980. David Manuel and his family established an Indo-Canadian church within South Abbotsford that has grown over the years to produce its own pastors and workers. Pastor David has gone on to disciple and mentor future Indo-Canadian pastors, as well as to create radio and television programs for evangelizing his fellow countrymen all over the world. In 1995 the church was rebuilt and enlarged. As it entered the 21st century some of its programs changed as well as its faces; but it continues to reach out to the lost and hurting while accepting every member as a valuable contributor to the work of God.